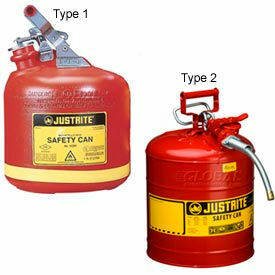 Justrite Safety Cans Are Engineered To Help Prevent Flammables From Igniting. Flashback is prevented by double mesh flame arrestor screen inside spout. Spring-loaded cap closes automatically. 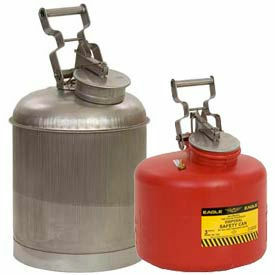 Justrite fuel tanks feature long-life synthetic gasket that resists virtually all liquids and maintains a tight seal. Environmentally safe Galvanized Steel model may be used for storing petroleum products where purity and color are not critical. High-Density Polyethylene resists corrosion. Polyethylene Funnel for Type 1 cans helps dispensing liquids. 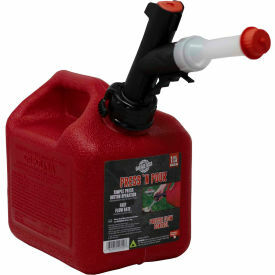 Color coding gas cans helps prevents accidents. Cans available in Blue, Green, Red and Yellow. 10 Year Limited Warranty.